I don’t know if this is a local dragonfly or was merely stopping by while migrating south, but I was happy when this Black Saddlebags dragonfly (Tramea lacerata) stopped circling a field and perched for a moment earlier this week at Occoquan Bay National Wildlife Refuge. 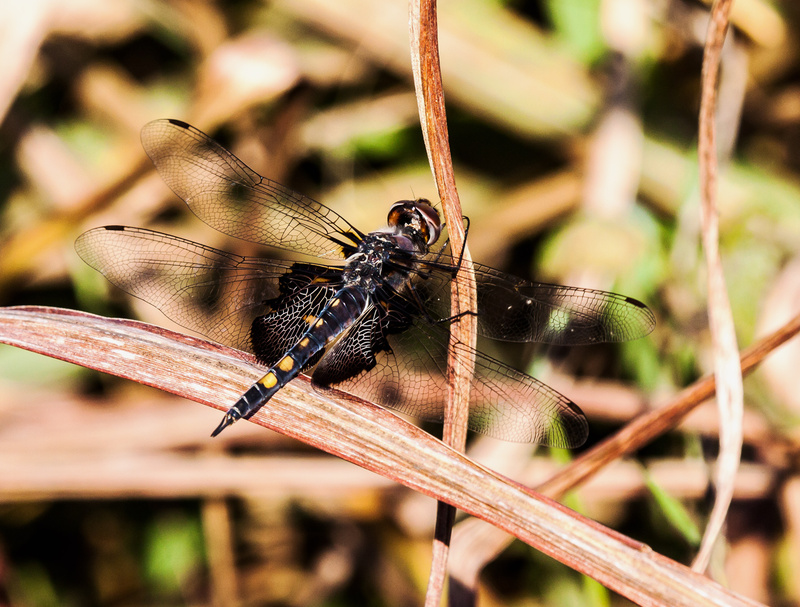 This species of dragonfly is one of several migratory species and in the early autumn I tend to see more Black Saddlebags dragonflies than at any other time of the year. As you might have guessed, the dark blotches on the wings caused some scientist to imagine that they looked like saddlebags. In some cases, I scratch my head when I learn the name of a species, but in this case the name seems to fit and doesn’t require too big a stretch of the the imagination. I love the contrast of the white veins in the black area, thta’s really stunning. Great shot, Mike. Thanks, Dan. These are pretty amazing dragonflies and the patches make them instantly identifiable when the are flying overhead. In general, dragonflies can be divided into perchers and fliers. The former spend most of their time perching and are fairly easy to photograph, because they often return to the same perch. The latter, including the Black Saddlebags, spend most of their time flying and you have to be patient and lucky to catch one when it finally decides to take a break.